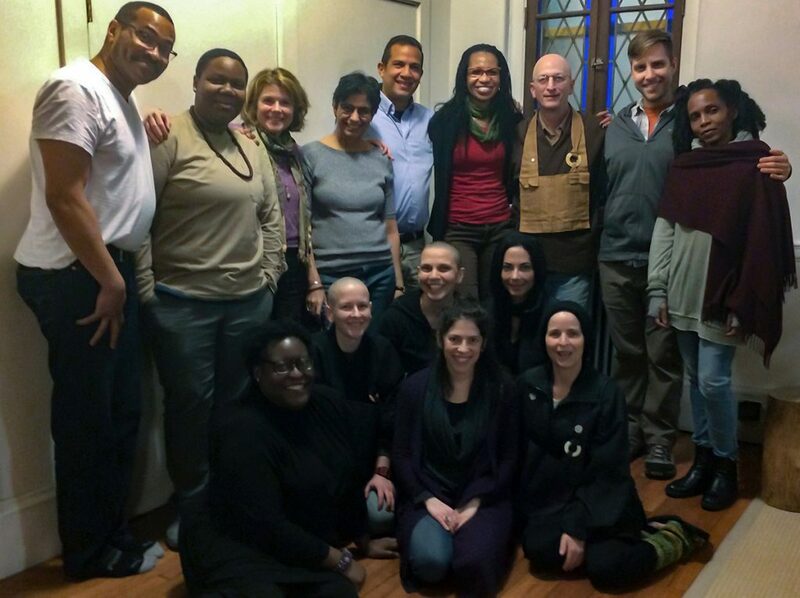 Among the present blessings of my monastic life, I count the chance to be part of a newly formed collaboration between members of the Temple’s People of Color Tea Group and the Monastery’s Beyond Fear of Differences Planning Group. Together, nineteen of us (about half of us identify as people of color and half as white) are working on creating a more inclusive and diverse community within the MRO. We’ve been referring to our joint group simply as POC/BFOD. Although our sangha is rich in some kinds of diversity—it includes people of all ages, from a range of social backgrounds, and of different sexual orientations—when it comes to racial or ethnic identity, it feels like part of our family is missing. Why is this? What can we do to change this? How can we create a practice environment where everyone seeking the dharma feels welcomed and included, and where we can together take up the powerful teachings of Zen? Last October, POC/BFOD held our first joint meeting here at the Monastery, guided by professional co-facilitators Eduardo Gonzales and Maryellen Whittington-Couse. After establishing dialogue guidelines, Eduardo and Maryellen invited us to briefly share our stories of identity and race. Seated in a circle in the Sangha House performance hall, with the afternoon light spilling in through those giant windows, we each gave voice to our experience. Although the sharing was framed as an introduction to a longer agenda, that’s not how it happened. Instead, those stories unfolded across the afternoon. We journeyed through time and space, into childhoods long since passed, throughout this country and over oceans, sharing memories and anecdotes of how race had shaped our life. The rest of the agenda items fell away, and by the time the last person had offered their words, it was almost time to go. It was an extraordinary afternoon, unlike any I’ve ever experienced. For me, it was a lesson in how deeply personal this kind of work is—rooted in specific people and real lives and intimate contact. The Sangha Treasure. 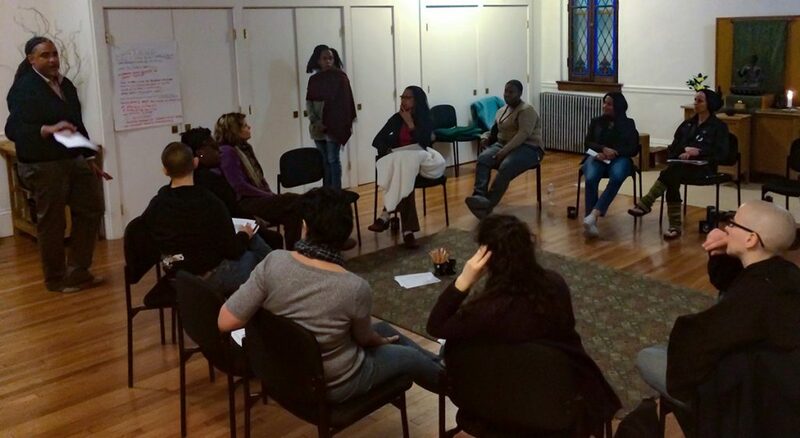 At our second meeting this past January, we gathered downstate, forming a large circle in the Temple Buddha Hall. Facilitator Eduardo Gonzales was back, giving shape to our discussion and providing lots of encouragement. We focused on starting to take action, looking at what the MRO is doing that creates barriers to practicing at the Monastery and the Temple not only for POC, but for other marginalized groups, like queer folks and transgender people. We talked about specific policy changes, like creating a Diversity Council and revising our approach to financial aid, and also about interpersonal aspects, like emotional intelligence and taking care to make sure new practitioners feel welcomed and adequately oriented. As we brainstormed lists of things we need to start, things we need to continue, and things we need to stop, some suggestions were relatively simple shifts and others would require more brainstorming, consideration and planning to implement. The question of how to move things forward loomed large. We agreed that although meeting in person was ideal, it was difficult to pull off. We realized would need to find ways to carry on our work together at a distance. 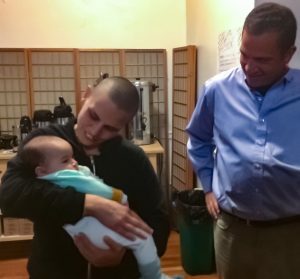 With several action items in place and some follow-up work delegated, we closed the meeting just as Tenke Pena’s wife, Stephanie, mother, Zoila, and four-month old baby girl, Luna, arrived for a visit. Luna is adorable beyond words, and passing a little baby from arm to arm turned out to be the perfect end to a productive afternoon. Shoan holding Luna as proud papa Tenke looks on. We are excited and hopeful about this work, and at the same time, realistic. We know that it may be years before our zendo truly reflects the diversity of the world we live in. At the same time, how wonderful to practice and train together with a shared intention of creating what Dr. King called “beloved community.” Those of us in POC/BFOD will be looking at ways to include the whole sangha in this effort, and we hope that you will be inspired and eager to participate, even as you may feel anxious, resistant or uncertain. Below, you’ll find reflections from some members of POC/BFOD on why we are doing this work, and how we see it relating to our practice in this sangha. I’ve been an MRO student since 1997 and I saw almost no diversity here in the first days of my practice. As a person from a community of color, the lack of diversity coupled with the very well-meaning but oh-so-ignorant biased comments contributed to my feelings of invisibility in the world, and made me experience some folks in the MRO as unwelcoming. It is better now, but we still have a lot of work to do. Today, societal expressions of bias are more sophisticated and sometimes cloaked in a robe of political correctness that creates confusion. The MRO is a reflection of our society and our times. I’m doing this work because of my commitment to the dharma, and my love for the MRO. I believe in us and in our ability to use the teachings as a way to co-create a transparent and inclusive community of practitioners. I want every single person who finds themselves at our threshold to come to know, well after they’ve entered, that this is a place we all can be felt, seen, and heard. This is the truth I hope we will strive for. I first became aware that I lived in a world created by and for the benefit of white people when I was in college, studying American history. I began to see it everywhere: in textbooks, in the news media, pop culture, the legal system, the economic system. I cared deeply about racial justice work, but when I got to the Monastery, this important aspect of my life fell away, without my seeming to notice it. I went from living in a racially and culturally diverse city to living in a largely white community in the Catskills. This work feels inseparable both from my bodhisattva vows and my monastic vows, as well as from alleviating so many other forms of suffering in the world: economic injustice, environmental injustice, and gender injustice. These systems took centuries to create and maintain, and they will take centuries to change and undo. I’m glad that we’ve begun creating the conditions to grapple with this in our own community so that we can find a way forward together. Life, or my life at least, feels as movement to experience seamless-love. Buddhism’s Not-Self Not-Otherness thus feels natural. But I am the other everywhere I go. Why? The answer to this question surely is of no consequence to living. BFOD is showing me that ‘they’ are not the ‘other’. I see me, my kind of humanity, interweave into and out of and back into every single BFOD participant. We are all genuinely baring our experiences as humans. Even when my and everyone else’s racist attitudes and harmful expressions abound, seeing our singular humanity is enough for the growth of peace within me. It is way more than enough. Growing up in Mexico, I was steeped in a culture in which race, class, and gender played a major role. Still, I was only vaguely aware of my privilege—which was based on my class and skin color—and the benefits it offered me. I could see I had access to places and opportunities that others were routinely denied, and this felt wrong and unjust. But I had no words for it, and certainly no solution. It wasn’t until I came to this country that I began to realize the pervasiveness of this kind of bias (in myself and others), and much later, that racism, sexism, and the like, were not isolated, individual instances of prejudice, but institutional forms of oppression. That is why I participate in the Beyond Fear of Differences work. I want to do what I can to uncover and remedy this systematic abuse of minoritized groups, as well as educate myself about the ways in which we can do this collectively. I also want to become aware of my own “othering,” a mechanism I now understand serves to protect me. This is not how I want to live my life. I understand that my liberation depends on everyone else’s. There is no “other.” Yet my experiences are not your experiences. So how do these two truths come together? How do identity and difference coexist in harmony with one another? Most importantly, how do I alleviate suffering in this realm, and not compound it? I see these as central questions in my life as a practitioner and a human being. When I began my participation in the BFoD work at the Temple, my expectations were fairly limited. I knew I wanted to scrutinize my own biases about white people, see where I could lower the barriers I felt I had constructed. I wanted to engage in this because I want the dharma to touch every aspect of my life, which it has the capacity to do. My practice had transformed my life in so many way, but race & privilege was a terrain that I had kind of kept my practice away from. I didn’t really want to look at what I was doing in creating “others.” The work has been surprising! Not only did I realize that I could indeed easily create and destroy barriers–the choice was firmly mine; but I learned the legitimacy of my needs as a Puerto Rican practitioner. Whereas I used to feel that I could make any structure work, I could “deal with it,” now I learned that I could say out loud when something is not working for me, and that my needs, my expectations, are legitimate, they are valuable. They even need to be said. Out loud, by me. This was not what I was looking for in BFoD work, but it’s a testament to the deeply engaged nature of this process that I am getting much more than I expected. Someone left this on the ZMM Facebook page, commenting on an article we posted about race and white privilege. After my initial facepalm, followed by umbrage, followed by a string of snarky replies I typed and deleted, I had to admit the question was a valid one. It was, in fact, my own question. When I first became aware of issues of race, gender, sexuality, and the ways these identities create opportunity and oppression, I too wanted to find a way not to engage them. I questioned the basis for the engagement and resorted to various turns of mind to neutralize their importance, including pleas for commonality (“we’re all human”) and harmony (“let’s not focus on what keeps us apart”). Over time I came to understand that my avoidance was in the service of both preserving my privilege and saving me from the pain of revisiting personal experiences of race-based bias and intimidation. BFOD has given me the opportunity to continue to evolve my understanding of power and bias with a group of dedicated sangha. Through the years of dialogues, readings, experiential exercises, and media presentations, I’ve come to have a more nuanced understanding of my own tenuous relationship to privilege and to reclaim parts of my identity that I had disowned for much of my life. I have a much clearer and more visceral understanding of how race and gender have functioned in my life, and how I can own the harm I’ve caused and the pain I’ve experienced. I was born in the late 1950s in Atlanta, Georgia. I grew up in an all-white neighborhood and attended an all-white elementary school. In 1969, Atlanta begin school desegregation (“forced busing” in the white-controlled media parlance of the time) which was a huge part of my experience as I grew into young adulthood. When I began my own study of race and racism in high school I came to feel I was gaining more understanding about and freedom from the racism I’d grown up with and been immersed in. Yet it wasn’t until much later, when we began our Beyond Fear of Differences training within our sangha that I began to understand how little I understood about race and racism; in particular, as it related to me as a white person and man. I had only ever considered the race of people of color without the actual sense and experience of myself as having race and the profound implications and everyday realities of that. I also had never deeply considered the intersections of patriarchy, gender and class as an intricate and deliberate system of oppression that I was both a result of and rewarded by. And so my daily vows and practice include this in my studying, understanding and embodying all that I have seen, and have yet to see, towards my not perpetuating suffering on others. I am deeply grateful to be part of this study and the eagerness of many students and sangha members to do this work. I deeply desire that our Sangha be a true refuge of practice for every person seeking Dharma, and that they find support and solidarity within the Sangha through their relationships with students who share similar racial, gender, sexual orientation, age and other characteristics of being, and with students who are different in all those same ways. In my role as Abbot, I am dedicated to nurturing this, at the same time that I know there are ways in which I am creating barriers to that very commitment, due to my own socialization and areas of blindness and habitual tendencies. May we, together, make more and more real and honest these teachings and their profound implications within ourselves, our sangha and our world. Though I had been attending services at Fire Lotus Temple since about 2007, and engaging in meetings and activities with the People of Color Tea Group since its inception, my overall engagement with the Temple and ZMM had been peripheral at best. I just didn’t feel like this was truly a community (Sangha) for a Black woman like me. In fact, the first time I came to Fire Lotus back in 2007 after recently moving to New York City, I didn’t come back for a long time. The strange stares from white sangha members and the feeling that I was invisible when people were done staring was too much for me. But as the years went by, I began to understand more and more that it was my spiritual practice that had suffered more from this isolation and spotty sangha practice than my ego. How can one grow in this practice if they are not even seen? It didn’t take long for me to connect the dots between the treatment that led to my own isolation and the similar feelings from others that result in a continuation of the lack of Black women who are teachers in the lineage, Black women who are leaders in the lineage, and the lack of a Sangha that can support the development and growth of potential Black women in the practice. Yes, there had been some conversations about the need to increase diversity and create a more inclusive Sangha for decades. But there are a few things that I’ve learned from my time working in policy advocacy: there comes a time when talking is no longer enough. There comes a time when the only way forward is action. And there is never a good or appropriate time to challenge systems of oppression and racial inequality. There will always be those who want things to stay just as they are because they benefit in some way from those systems. So, it has been amazing to take part in ZMM taking the courageous and necessary step to move from discussion to action through our joint POC/BFOD Initiative. It is my hope that the whole Sangha both at Fire Lotus and ZMM will embrace and support this vital work, with everyone understanding that their liberation is tied to mine and others like me. One cannot happen without the other. It is also my hope that this initiative will help lead the Sangha into one that is representative of the 21st Century and beyond, and that it will be a beacon of hope, community, growth, and potential for all who enter its doors in the future. I joined BFoD with a sincere interest in and openness to addressing issues around racism, sexism, dominance, power, and privilege. I soon learned that I truly don’t know what I don’t know. It’s been a powerful, at times uncomfortable, process of self-reflection, as well as engaging with others further along this path. With each meeting, I feel more enlivened and committed. I have long felt a deep sensitivity to speciesism. Here, we are all part of the dominant group, responsible for the objectification, exploitation, and disregard of other forms of life and their environments. Personally, it helps me to frame other instances of discrimination in terms of this awareness. Seeing into our assumptions of human/white/male… privilege, power, and dominance. Listening to the perspective of the “other” in order to experience the whole problem. Stepping towards a more open and compassionate way of being with one another. As a white woman in America, I have been raised in a culture that rewards silence and blindness on issues of power and privilege. My economic class and skin color have privileged me in innumerable ways. At the same time, I inhabit a Jewish woman’s body, whose worth is assessed, in large part, based on my physical form. I am not proud that the eyes judging me are sometimes my own. Decades ago, as a young adult practitioner and resident at ZMM, I felt myself in a familiar role… trying not to take up too much space, glancing in the mirror too often, subtly feeling my body watched. Being at the Monastery changes the context, but not the fundamental problem. I feel tension around my own assimiliation as a Jew, the ways I have absented myself from the culture, history, and religion I was born into, distanced myself from the violence my family members and ancestors experienced because of that aspect of their (and my) identity. And I have tried to distance myself from the racism perpetuated by Jews I am related to by blood or by association. And what about my own racism? Who am I? I am the violence and the wound. And I am also the healing. Buddhism offers me a way into this exploration, and Beyond Fear of Differences initiative invites me into dialogue with myself and the sangha about socially taboo subjects. It helps me build capacity to feel discomfort and transform avoidance into engagement. For me, addressing bias and privilege necessarily involves contending with my karma, fear, ignorance, shame, my feelings of urgency and hopelessness, the tension that arises when conflict and challenging perspectives appear. But, when I dig beneath the surface, I am motivated to do this work by love—I’m committed to human happiness and freedom, including my own.